11 | September | 2009 | J&A + fun! So when we were at Pizza hut for Alex’s Birthday they had a fake tattoo dispenser. So Aunt Christina bought one for Emmy. Here is a close up! Emmy was so excited! Now whenever she gets a stamp from school she calls it a tattoo. 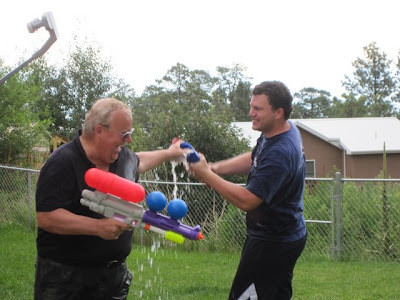 One day when we were little my dad went to the store and got us all these supersoakers and to surprise us. We ran around our yard and had a giant waterfight and it was really fun! So my mom found them in the garage and brought them down to Los Alamos this year. 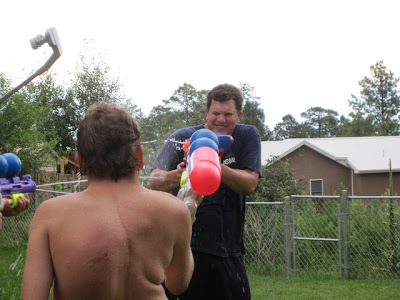 After we played tennis one morning we were all pretty hot so we decided to have a water fight in the back yard. Our yard isn’t really that big so it was a pretty funny fight since there was really nowhere to run! Alex and Christian teaming up on Christina while Emmy cheers them on! Alex trying to dump his entire tank of water on my dad! I love Alex’s face in this one! So determined!! Kaylee and I stayed safely on the steps with a camera for our shield! My mom took this one for me!